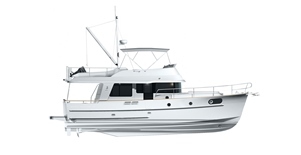 Designed to increase the living space, the interior of the Swift Trawler 44 is full of light. Her fittings have a variety of functions and there are a large number of storage spaces. Her cabins look like rooms and in a few steps the convertible sofa turns the saloon into a guest room. The ergonomic helm station and anti-glare windshield enhance safety underway. The Mahogany woodwork adds a classic yet contemporary touch, creating a warm atmosphere. CE certification: B12 / C14. 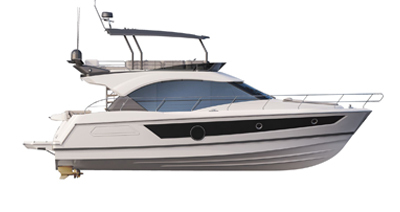 Flybridge lounge seating up to 5 people, built-in storage, teak table. Chaise longue-style sun-lounger on the flybridge. Sink and storage on the flybridge. 3.41 x 1.00 m stern deck with integrated swim ladder and stowage locker. Large fitted U-shaped galley with opening window, two stainless steel sinks, refrigerator, 2-burner kitchen hob, gas oven, and worktop. Large stairs to access flybridge. Sofa converting into double bed. Owner's cabin: central bed, large portholes and storage spaces. Guest cabin with double bed, large porthole, and hanging locker with light. Owner bathroom is ensuite with separate shower and proper seat on toilet. Electric fresh water toiled with offset 120 L rigid tank, washbasin. Second bathroom with electric toilet.